SUNNYVALE, Calif., August 4, 2014 - The fourthMobile User Objective System (MUOS) satellite in the launch order is progressing in its final testing phase, having successfully cleared acoustic tests. This evaluation used powerful sound waves to simulate vibrations the satellite will experience during launch. Now the satellite moves on to thermal vacuum testing, which is the last step in its environmental trials. "MUOS-4 is showing all the benefits of learning curve and process improvements that we have implemented over time. To date, we have seen a 74 percent reduction in non-conformance defects and a 45 percent reduction in labor hours over our first build," said Iris Bombelyn, vice president of Narrowband Communications at Lockheed Martin. The MUOS satellite will complete environmental and final system checkouts in the coming months, readying for launch in summer 2015. MUOS is a next-generation narrowband tactical satellite communications system designed to significantly improve ground communications for U.S. forces on the move. MUOS will provide military users more communications capability over existing systems, including simultaneous voice, video and data similar to the capabilities experienced today with smart phones. SUNNYVALE, Calif., Dec. 1, 2014 /PRNewswire/ -- Lockheed Martin [NYSE: LMT] has completed thermal vacuum testing on the fourth satellite scheduled to launch and join the U.S. Navy's Mobile User Objective System (MUOS) constellation. This milestone comes just weeks after the company shipped the third MUOS satellite to Cape Canaveral Air Force Station in anticipation of its January launch. MUOS operates like a smart-phone cell tower in the sky, vastly improving current secure mobile satellite communications for warfighters on the move. For the first time, MUOS Wideband Code Division Multiple Access technology users will have beyond-line-of-sight capability to transmit and receive voice and data using an Internet Protocol-based system. The launch of this next satellite, designated MUOS-4 by the Navy and expected in the second half of 2015, will complete the operational constellation and provide global coverage. "The successful completion of thermal vacuum testing assures that MUOS-4 can endure the extreme hot and cold temperatures it will experience throughout its on-orbit mission life," said Iris Bombelyn, vice president of Lockheed Martin's Narrowband Communications mission area. "The delivery of this fixed price vehicle shows a clear advantage for block buys to drive down defects and maintain low costs through learning curve advantages." Completed November 12, thermal vacuum testing was conducted inside the Dual Entry Large Thermal Altitude chamber at Lockheed Martin's Sunnyvale, California satellite integration facility. MUOS-4 now proceeds to final integrated system testing prior to launch later next year. Lockheed Martin is currently under contract for five MUOS spacecraft. On Nov. 5, MUOS-3 was shipped to Cape Canaveral Air Force Station, Florida in support of a January launch. MUOS-2 was launched and handed over to the Navy for operations in 2013. MUOS-1 was launched and became operational in 2012. MUOS-5 is expected to launch in 2016. Wasn't MUOS 4 supposed to be the third launched? I thought it was delayed because of a soldering defect. You can find that info on Gunter's Space Page: http://space.skyrocket.de/doc_sdat/muos-1.htm. Thank you for clarifying this. I had a feeling I also found this out on Spaceflight Now, but I do not have that link. Thanks again, Gunter. Now I'm more confident about MUOS 3 and 4's fates. United Launch Services LLC, Littleton, Colorado, has been awarded a $138,041,011 firm-fixed-price modification (P00086) to previously awarded contract FA8811-13-C-0003 for launch vehicle production services (LVPS) under the terms of the requirements contract. Contractor will execute a requirement for fiscal 2015 LVPS in support of the launch vehicle configuration of one National Reconnaissance Office Atlas V 541. This modification also procures backlog transportation for the GPS IIF-10 and GPS IIF-11 missions as well as mission specific commodities for the MUOS-4 mission. Work will be performed at Centennial, Colorado; Decatur, Alabama; Vandenberg Air Force Base, California; and Cape Canaveral Air Force Station, Florida, and is expected to be complete by July 29, 2017. Fiscal 2015 Air Force missile procurement and Navy weapons procurement funds in the amount of $138,041,011 are being obligated at the time of award. Launch Systems Directorate, Space and Missiles Systems Center, Los Angeles Air Force Base, California, is the contracting activity. MUOS 4 is now scheduled for August 27, which is the same date as NROL-55. I understand that L-55 is launching from Vandenberg, but my question is: how on Earth is ULA gonna launch both missions on the same day? They will not be launched on the same day. Expect one of the dates to move soon. What's the reason for that slip? Too much stress over two important missions? I'm pretty sure it's not stress. CAPE CANAVERAL AIR FORCE STATION, Fla., June 29, 2015 - Delivered by the U.S. Navy and Lockheed Martin (NYSE: LMT), the fourth Mobile User Objective System (MUOS) satellite arrived at Cape Canaveral Air Force Station, Florida, yesterday prior to its expected August launch aboard a United Launch Alliance Atlas V rocket. MUOS-4 is the latest addition to a network of orbiting satellites and relay ground stations that is revolutionizing secure communications for mobile military forces. Users with operational MUOS terminals can seamlessly connect beyond line-of-sight around the globe. MUOS' new smart phone-like capabilities include simultaneous crystal-clear voice, and video and mission data, on a high-speed Internet Protocol-based system. Traditional UHF satellite communication systems allow users to 'talk' as long as they are geographically close enough to be under the coverage footprint of the same satellite. "MUOS allows troops all over the world to talk, text and share mission data seamlessly, while traveling, like a cellular network, without having to worry about where they are in relation to a satellite," said Iris Bombelyn, Lockheed Martin's vice president for narrowband communications. "MUOS-4 will complete our near global coverage, reaching further north and south toward the poles than ever before." Manufactured at Lockheed Martin's Sunnyvale, California facility, MUOS-4 was shipped from nearby Moffett Federal Airfield, where the 60th Air Mobility Wing of Travis Air Force Base loaded the satellite aboard a C-5 Galaxy aircraft for delivery. In Florida, Astrotech Space Operations, a wholly-owned subsidiary of Lockheed Martin, will complete MUOS-4's pre-launch processing. The MUOS network is expected to be operational by year-end. MUOS-1, MUOS-2 and MUOS-3 launched respectively in 2012, 2013 and January 2015. All four required MUOS ground stations are complete. More than 55,000 currently fielded radio terminals can be upgraded to be MUOS-compatible, with many of them requiring just a software upgrade. According to the Rocket Launch Viewing Page at www.launchphotography.com, the launch time is in between 4:07 and 8:07 AM, so the legitimate T0 should be at 6:07:00 AM EDT (10:07:00 UTC). NROL-55 is now scheduled for Sept. 25 from VAFB. 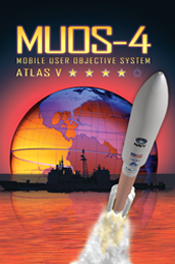 Rocket/Payload: An Atlas V 551 will launch the Navy’s fourth Mobile User Objective System (MUOS-4) satellite. MUOS4Date/Site/Launch Time: Monday, Aug. 31, 2015, from Space Launch Complex-41 at Cape Canaveral Air Force Station, Florida. Mission Description: The Mobile User Objective System (MUOS) is a next-generation narrowband tactical satellite communications system designed to significantly improve ground communications for U.S. forces on the move. MUOS will provide military users 10 times more communications capability over existing systems, including simultaneous voice, video and data, leveraging 3G mobile communications technology. Launch Notes: MUOS-4 will mark the 56th Atlas V since the vehicle’s inaugural launch in August 2002 and the sixth in the 551 configuration. Previous missions launched on Atlas V 551 missions include three MUOS missions as well as the New Horizons mission to Pluto and the Juno mission to Jupiter. Launch Updates: To keep up to speed with updates to the launch countdown, dial the ULA launch hotline at 1-877-852-4321 or join the conversation at www.facebook.com/ulalaunch, twitter.com/ulalaunch and instagram.com/ulalaunch. Go Atlas! Go Centaur! Go MUOS-4! CAPE CANAVERAL AIR FORCE STATION, Fla., August 13, 2015 - The fourth Mobile User Objective System (MUOS) satellite built by Lockheed Martin [NYSE: LMT] for the U.S. Navy was encapsulated in its protective launch vehicle fairing August 10. It is scheduled to launch August 31 aboard a United Launch Alliance Atlas V rocket. MUOS-4 is the latest addition to a network of orbiting satellites and relay ground stations that is revolutionizing secure communications for mobile military forces. Users with operational MUOS terminals can seamlessly connect beyond line-of-sight around the globe and into the Global Information Grid. MUOS' new smart phone-like capabilities include simultaneous, crystal-clear voice, video and mission data, over a high-speed Internet Protocol-based system. "Delivery of this fourth satellite for the U.S. Navy completes the initial MUOS constellation and provides near-global coverage for the network," said Iris Bombelyn, vice president of Narrowband Communications at Lockheed Martin. "For our mobile forces, that means for the first time they will be able to have secure, high-fidelity voice conversations, networked team calls and data exchange, including video, with anyone around the world connected with a MUOS terminal." MUOS, which also supports the legacy ultra high frequency communications satellite system, will provide comparatively 16 times the capacity of the legacy system and eventually replace it. The MUOS-1, MUOS-2 and MUOS-3 satellites launched respectively in 2012, 2013 and January 2015. All four required MUOS ground stations are complete. MUOS-5, an on-orbit Wideband Code Division Multiple Access (WCDMA) spare with additional legacy system capability, is expected to launch in 2016. More than 55,000 currently fielded radio terminals can be upgraded to be MUOS-compatible, with many of them requiring just a software upgrade. Lockheed Martin manufactured MUOS-4 at the prime contractor's Sunnyvale, California facility. Earlier this summer, the satellite shipped to the Cape, where it was pre-launch processed and finally encapsulated at Astrotech Space Operations, a wholly-owned subsidiary of Lockheed Martin. The Navy's Program Executive Office for Space Systems and its Communications Satellite Program Office, San Diego, California, are responsible for the MUOS program. In preparation for launch on an Atlas V rocket, the U.S. Navy's fourth Mobile User Objective System (MUOS-4) satellite is encapsulated inside a 5-meter payload fairing.